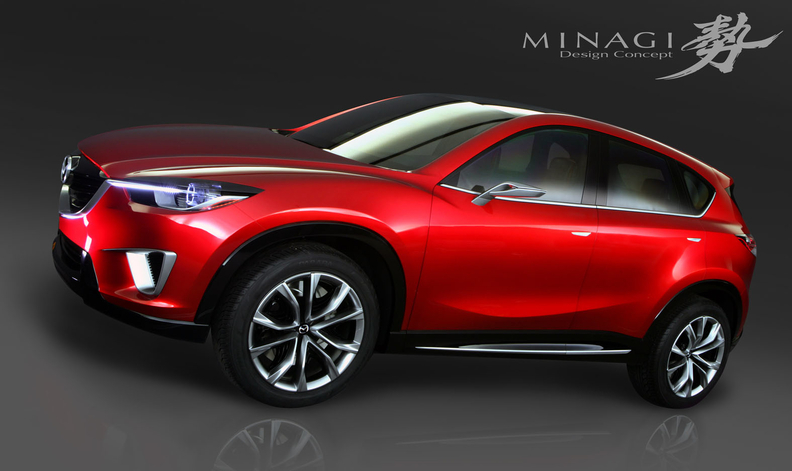 The Minagi concept is the basis for Mazda's CX-5 compact crossover. Mazda Motor Corp. will debut the production version of its new CX-5 at the Frankfurt auto show in September ahead of its European sales launch in the first quarter of 2012. The compact crossover will be based on the Minagi concept, which was unveiled at the Geneva auto show last March and makes its U.S. debut at the New York auto show today. Mazda has not released the CX-5's pricing details yet, but it plan to slot the model below the CX-7 mid-sized crossover, which starts at 31,290 euros in Germany. The CX-5 will be the smallest model in Mazda's crossover lineup that also includes the CX-9 large crossover, which is not sold in Europe. The CX-5 will be Mazda's first production vehicle to combine its new design theme, called Kodo, which is Japanese for soul of motion. The CX-5 also will include Mazda's all-new gasoline and diesel engines, more efficient manual and automatic transmissions and a stronger, lighter body.